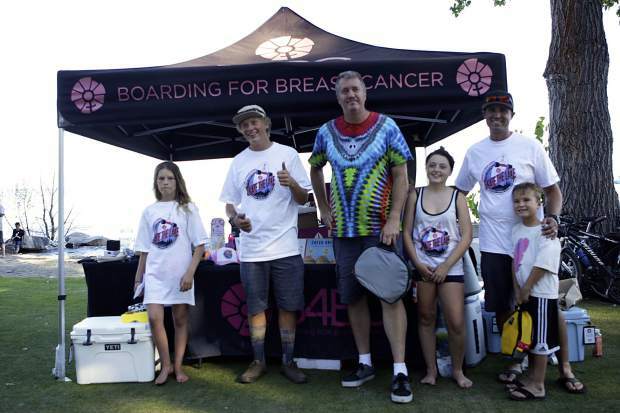 This year’s Skate the Lake brought in nearly $30,000 for Boarding for Breast Cancer’s support and prevention programs. Nearly 100 participants on skateboards, longboards, bicycles, rollerblades, and scooters helped raise funds as part of this year’s Skate the Lake. 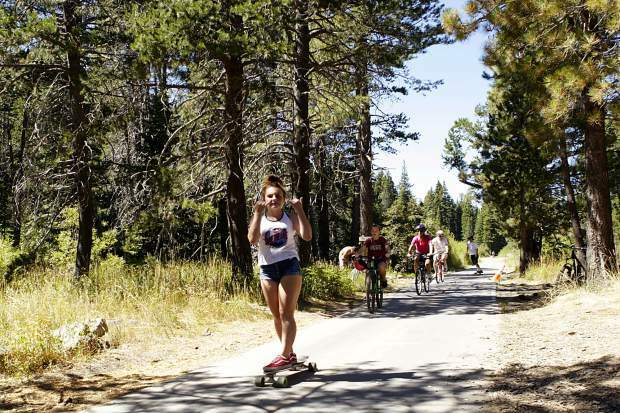 Skaters roll along a section of trail between Squaw Valley and Tahoe City. 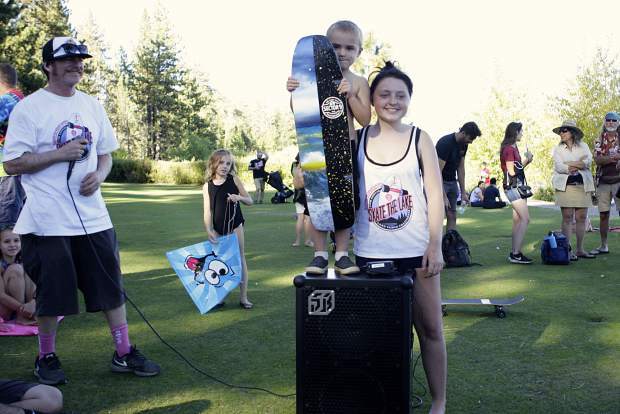 Katie Lyssand poses with Michael Raynal-Dowell after giving the youngster a new longboard. Raynal-Dowell donated his piggy bank containing $72 to the cause. This year's top fundraisers pose after completing the 28-mile Skate the Lake. Fifteen-year-old Katie Lyssand has raised more money than any other at the annual Skate the Lake event for the past several years. And with her donation of nearly $1,500 this year, she’s raised more than $16,000 in four years at Skate the Lake. While Lyssand was dethroned as this year’s top earner, one local 4-year-old gave her perhaps the most heartfelt donation she’s ever received. 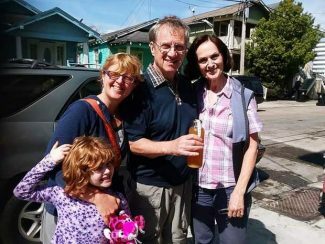 After seeing his mother Danielle Raynal-Dowell donate to Lyssand’s campaign, Michael Raynal-Dowell wanted to know why. 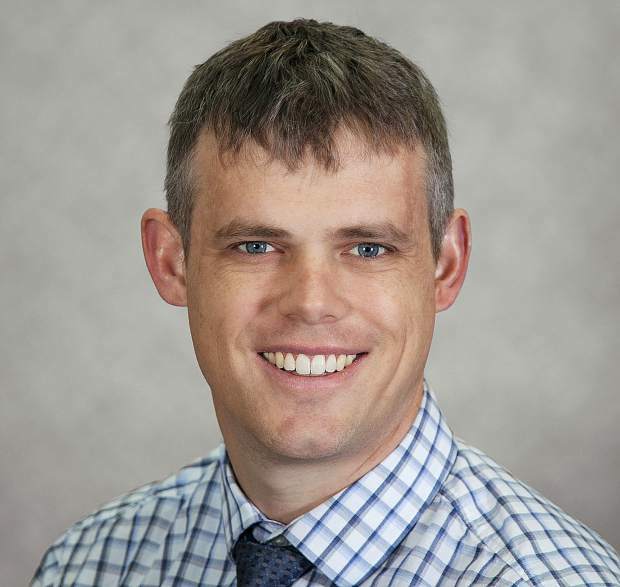 “He asked me why I had my wallet out, and then I said, ‘Well I’m donating to Katie … it’s for people with cancer.’ He asked me what cancer was and I told him it makes a lot of people really sick, and kids like you really sick,” said Raynal-Dowell. When Lyssand opened the youngster’s piggy bank, she was shocked at finding $72 Michael had saved. 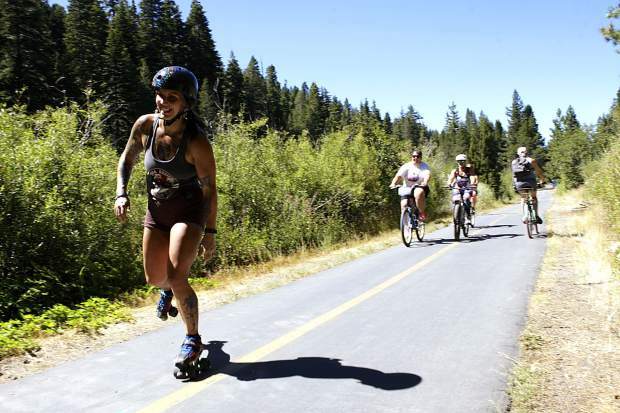 This year’s 14th annual event brought in nearly 100 skaters to the bike paths around Tahoe City last weekend, and raised nearly $30,000 for Boarding for Breast Cancer’s prevention and survivorship programs. After the event concluded, Lyssand rewarded the youngster for his generosity with a brand new Sector 9 longboard she’d won the day before. 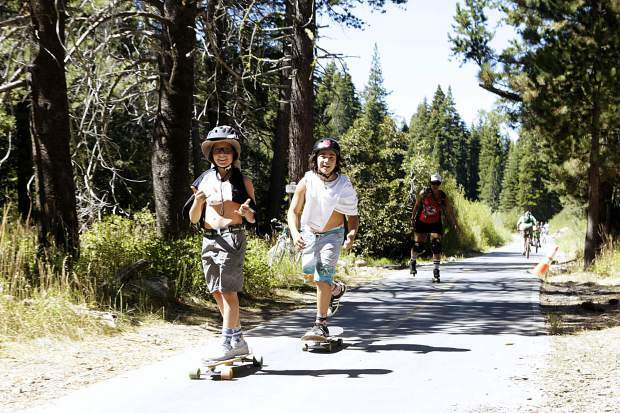 This year’s event raised several thousand dollars more than last year and attracted roughly twice as many skaters to take on the 28-mile journey along from Ed Z’berg Sugar Pine Point State Park to Squaw Valley, and then back to the finish line at Commons Beach in Tahoe City. 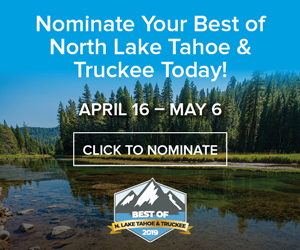 Previously the fundraiser had concluded at Heritage Plaza, but, according to the program’s board chair and co-founder Lisa Hudson, a partnership with the North Lake Tahoe Chamber of Commerce allowed for the event to be moved to Commons Beach. Also new this year was the option for dropping in at Squaw Valley for a 7-mile ride back to Tahoe City. Perhaps another reason this year’s event reached nearly 100 riders was the involvement of Tahoe Longboards, and its owner Chuck Vogt, who returned to the event after missing the last several years. Vogt, who co-founded the event, said he needed to “step out and regroup” after helping start the event, but made his return this year, bringing a legion of local skaters along with. 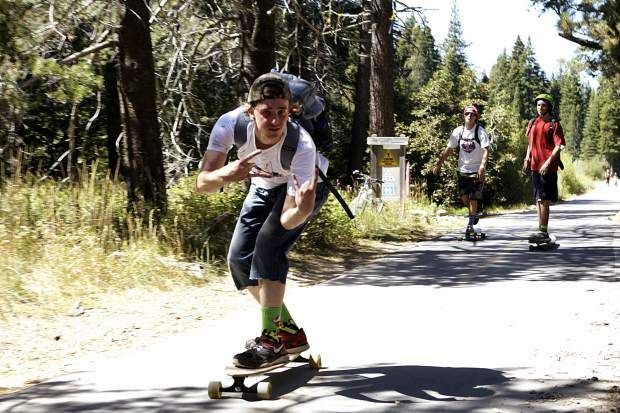 Coming into this year’s event, Jason Knight had participated in 12 straight Skate the Lakes. This year he showed up with his two sons for the 8:30 a.m. start feeling a little groggier than normal, but Knight wasn’t about to let a graveyard shift at the North Lake Tahoe Fire Protection District end his or the family’s streak. As a family, the Knights were able to knock off Lyssand as this year’s top fundraisers, bringing in roughly $1,600. The family has brought in $10,000 in total throughout the years.